Breaking from the norm to post a couple of cool Kurosawa-related items. First is a gorgeous print of Yojimbo by one of my favorite artists, Paul Pope. 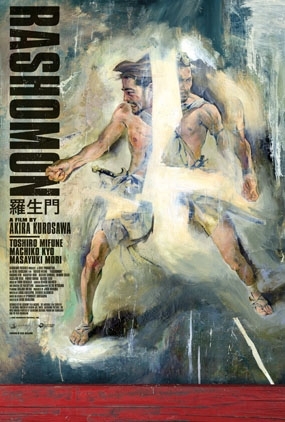 Next up is a poster for the theatrical reissue of Rashomon, available in the Criterion store. This painting is by the amazing Kent Williams, who pioneered using a painted style to create comic books back in the late 1980s, alongside Jon J Muth and Bill Sienkiewicz. Erik Skillman has more on the story behind this. If Kent's work looks familiar, it's because he did the cover for the Criterion DVD of Miss Julie. Get 'em while they're hot! Kurosawa is always in style. In fact, this book isn't new, but if you've never read Scott Morse's graphic novel tribute to Akira Kurosawa, The Barefoot Serpent, do yourself a favor and seek it out. Amazon has a look inside option so you can preview the book. Scott is an amazing artist, having done a variety of comics over the years and currently working on the development team at Pixar. He designed, among other things, the closing credits for Ratatouille. I was lucky enough to be Scott's editor when I was at Oni Press, and he also contributed illustrations, in addition to publishing the first edition, of my debut novel, Cut My Hair .